This contest is for a Jeff Rowe 2007 Leaf Limited Rookie Phenoms Auto #’ed/99. Rowe didn’t make it very far in the NFL, but this card looks great and needs a good home. Good luck!!! This contest will end Friday, March 9, 2018 @ 8:00 p.m. EST. 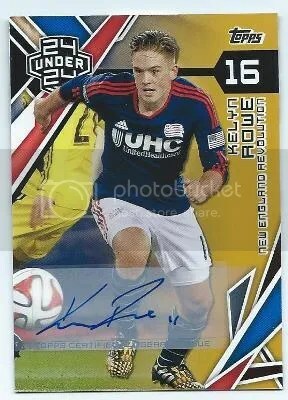 Congrats to Louizz on being the lucky winner of the Kelyn Rowe 2015 Topps MLS Gold Parallel Auto #’ed/25. Once Louizz sends me their mailing address, I will ship this card ASAP. Thanks! This contest is for a Kelyn Rowe 2015 Topps MLS Gold Parallel Auto #’ed/25. Good luck!!! This contest will end Friday, April 24, 2015 @ 8:00 p.m. EST.